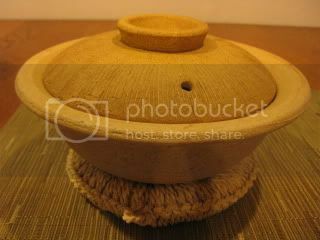 Mini-size donabe often becomes a wonderful friend. 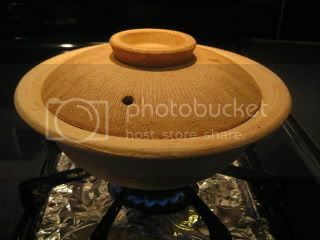 Tonight, I used small size classic-style donabe, "Yu Kizeto", which is a ultra light-weight donabe. I made the broth with dashi stock, miso, and sake-kasu (sake lees). 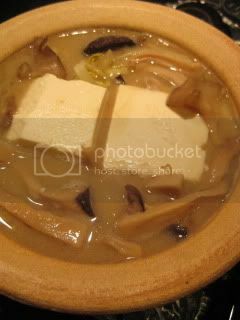 Mixed mushrooms, kabu (Japanese turnip), and tofu were cooked inside. Shungiku (chrysanthemum leaves) was added at the end. 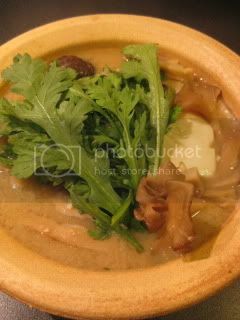 The entire donabe was served at the table, and I could eat right out of it. Itadakimasu! So delicious. Single serving hot pot is fantastic.